ten chi jin... philosophy or technical? Ten Chi Jin is one of the most difficult topics, technically speaking. Ten means sky or heaven, Chi is the earth or the ground and Jin represents humans and mankind. There is a famous phrase for Wado: “Wa Suru Ten Chi Jin No Rido”. Roughly translated it means that the reason or the truth of Ten, Chi and Jin lies in the connection and the harmony between them. For Wado, Ten Chi Jin is generally a philosophical issue. Interestingly, as Yokoyama sensei told me, the body can also be divided in three parts from side to side. In the old days this was also referred to as Ten, Chi, Jin. Usually, we consider that the body can be divided into a left and right side, dividing the body from top to bottom, so this is quite a unique way of thinking. 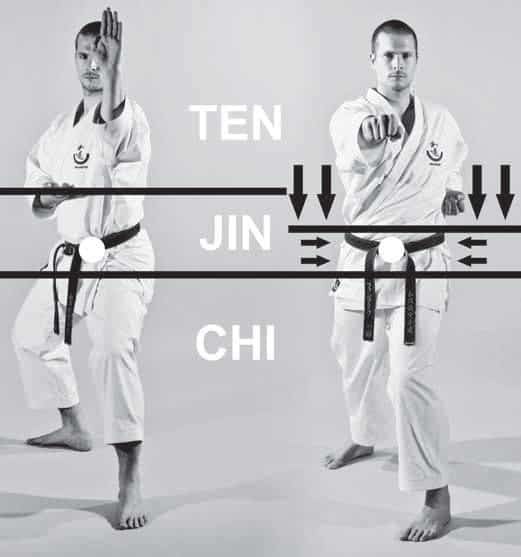 00.00 - 00.45 explains about using Ten Chi Jin.